The ability to drive and own a car is a form of independence that is coveted by older adults. Removing this independence is a sensitive topic and needs to be raised prior to the time the children feel that their parent or parents no longer can drive safely. You can’t wait for an accident or major traffic violation to take action. Sadly, it is up to the adult children of senior citizens to prevent such tragedies. My father-in-law refused to give up his license. Prior to his surrendering his license, my wife and I followed him home from a restaurant and watched him drift over the center line as he made a left turn. We also witnessed him drive through stop signs. These clues provided the information we needed to initiate the “giving-up-the-keys” discussion. One strategy is to request that the senior drives only during the day. This could be the first step to surrendering the license. Another strategy is to have someone else in the family, someone they are more likely to listen to, speak with them. In my case, my eldest nephew sat down with his grandparents and convinced them to use a driver. That began the process. When my father-in-law had an accident and his wife said she would not ride with him any longer, he finally stopped driving and surrendered the keys. Prior to giving up his keys, we learned he purchased a replacement vehicle before the family saw the damage to the previous one. To say he was resistant to surrendering his license would be an understatement. Ultimately, my wife’s parents hired caregivers for household chores and these individuals became the designated drivers and used the family vehicle to transport them. A move to assisted living or a senior facility may also provide an opportunity to have the car keys conversation, especially if the facility provides transportation to doctor appointments, local entertainment, and shopping. I have been encouraging my friends whose parents are in their eighties and nineties to start the conversation, but it might be too late. Best outcomes result from conversations held long before the surrender of the driver’s license becomes necessary due to ill health, an accident, or family finances. 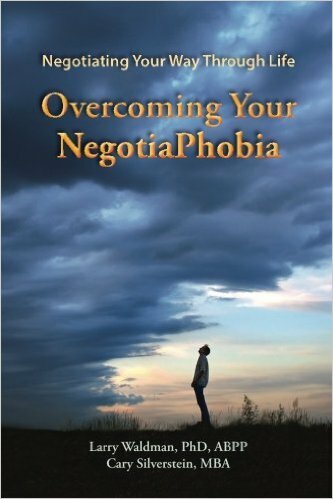 Overcoming Your NegotiaPhobia is available on Amazon by clicking HERE.